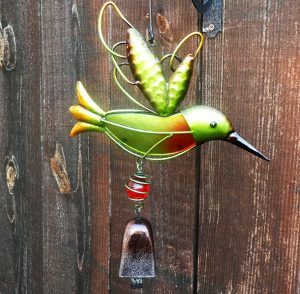 Why not pay homage to the incredible hummingbird with some cool hummingbird yard art? When decorating, I usually stay away from anything theme related. 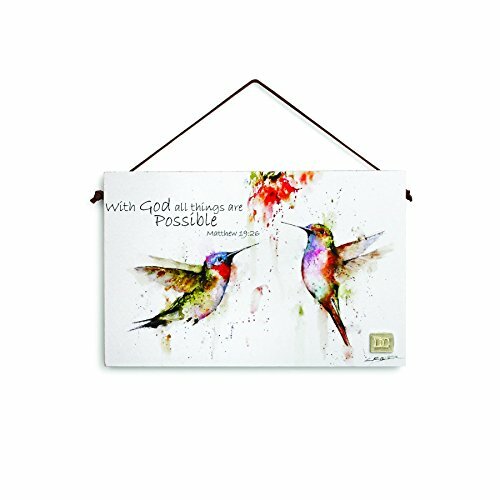 Hummingbirds have changed this self imposed decorating rule. They are irresistible to me. 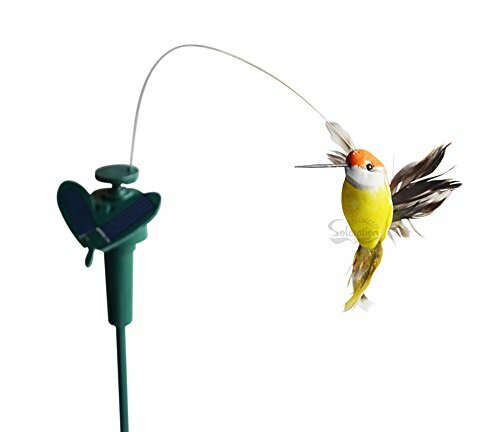 This interesting piece of Hummingbird yard art gives me so much pleasure! 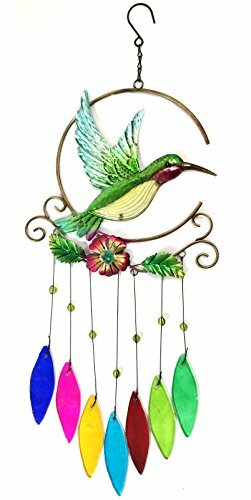 Like a lot of my garden decor, I often move this hummingbird ornament around both indoors and outdoors. I especially love the iridescent green metal and glass. When the light hits the metal it warmly glows. I also love the red glass ball that hangs just above the bell. The bell has a tarnished, distressed look that is pretty cool. The bell does “ring” occasionally, but only on super windy days. My garden is very sheltered so it takes a pretty good breeze to move this Hummingbird ornament. Now that I’ve had this particular hummingbird ornament for a couple of years, the ornament has aged well. Not too much wear and tear, just nicely distressed and vintage looking. 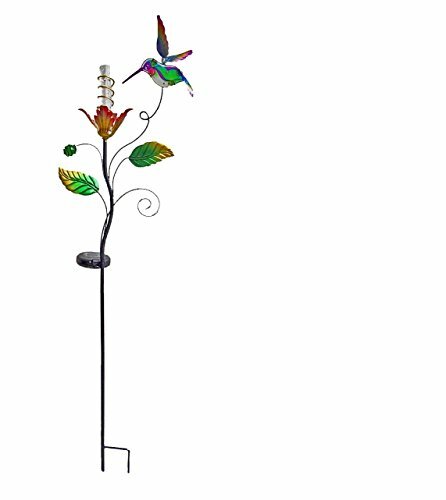 My solar Hummingbird garden stake, pictured here, has been a favorite addition to my garden. The green colored crackle glass catches different angles of sunlight throughout the day . This creates a fascinating piece of garden decor. Then night comes along and the crackle glass solar light kicks in. It’s the prettiest green color and illuminates very well. I like to keep my Hummingbird Solar Light off to himself. The sparkling green deserves to be a focal point, set apart from my other crackle glass solar lights. I love the idea of garden decor that serves a purpose both day and night. 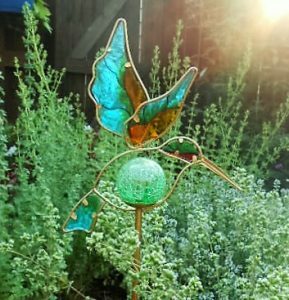 Hummingbird solar garden stakes do that very well. 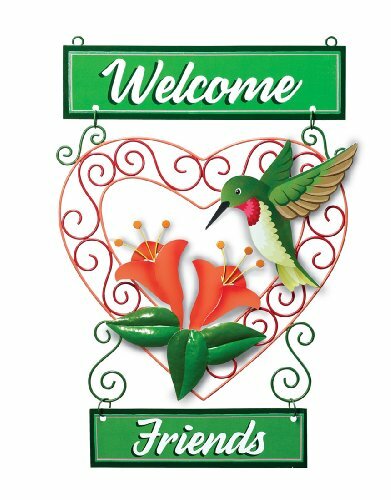 Whether delivering a cute message or displaying a hummingbird in some fashion, a hummingbird plaque is a perfect addition to your garden. 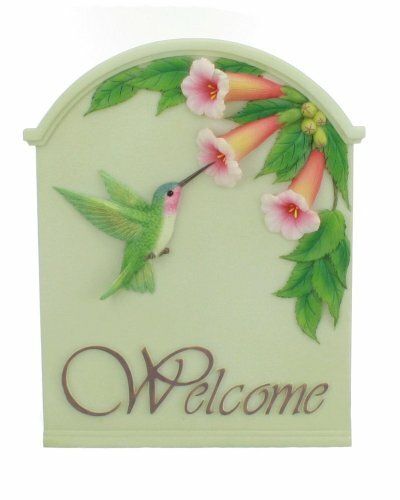 You can place a plaque or sign outside the entrance to your home to greet your guests. 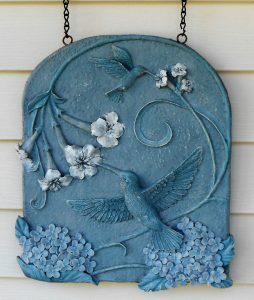 Hummingbird garden plaques displayed on your garden fence or wall make a great statement as well. 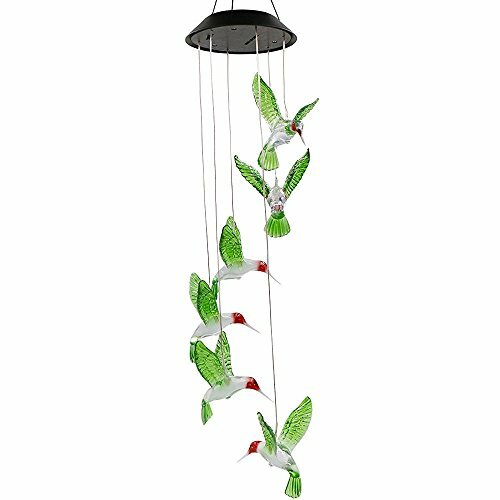 My next addition of Hummingbird yard decor will most definitely be Hummingbird Wind Chimes. Both wind chimes and hummingbirds bring happiness and cheer to the garden. 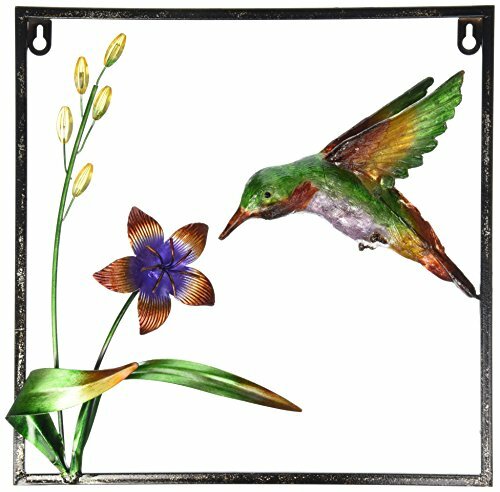 Together, they add an enchanting element to the spirit of the garden. 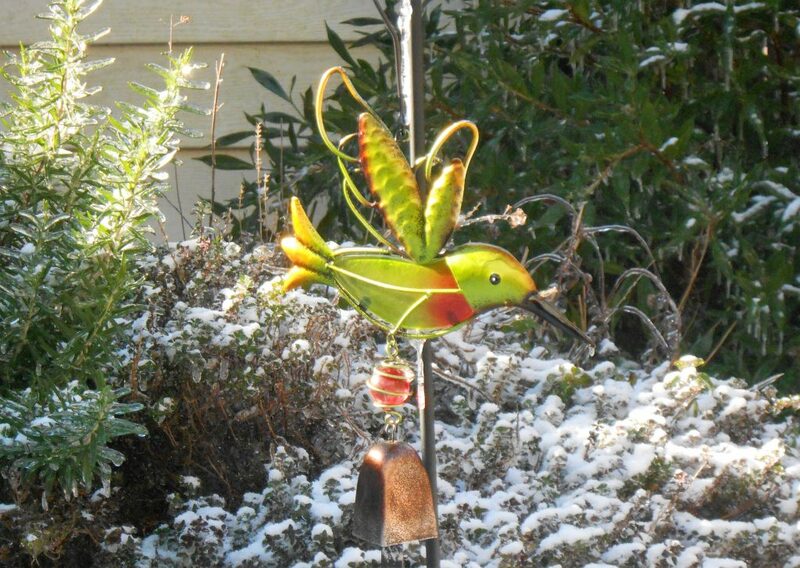 Hummingbird garden decor makes a huge difference in my garden in winter months. I can’t begin to tell you how much it cheers me up to look outside and see this. I love garden decor that looks great year round! 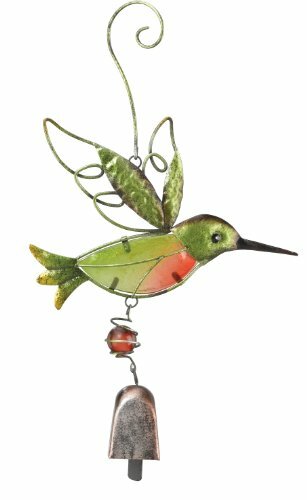 It’s cool that I can enjoy hummingbirds year round, even though the real life version has to winter in warmer climates in my area. 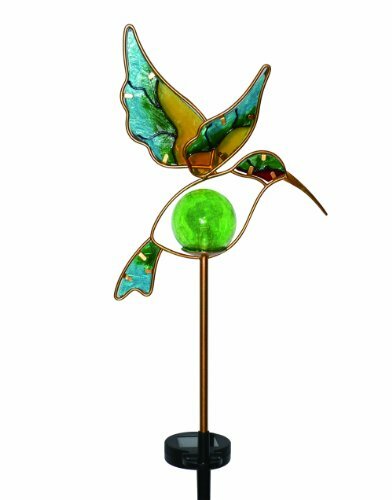 Colored Glass, Garden Art, Garden Decor, Glass Garden Stakes, glass hummingbird ornaments, hummingbird ornaments, hummingbird wind chimes, Hummingbird yard art, Outdoor solar garden decor, solar hummingbird garden stake.